There are a few more than a dozen committee members left in this hearing. 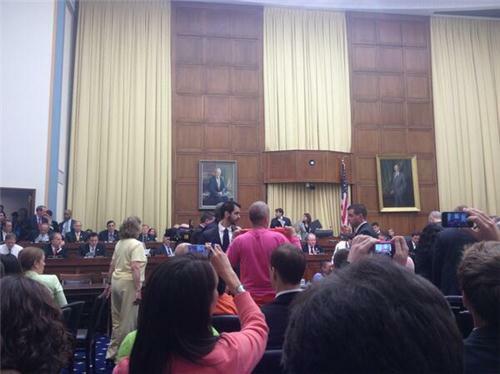 The #Benghazi hearing is wrapping up its fourth hour. Issa notes the time to ask witnesses to sit w/out a break has expired (after four hours) - calls a 10-minute break in #Benghazi hearing. Pres Obama says within three days of the talking points, he was publicly declaring the attack was an act of terror by Libyan extremists. WASHINGTON, May 13 (Reuters) - U.S. President Barack Obama said on Monday the United States would keep increasing pressure on Syrian President Bashar al-Assad to stop the "appalling violence" in Syria, and was still investigating the reported use of chemical weapons there. "We will continue to work to establish the facts around the use of chemical weapons in Syria and those facts will help guide our next steps," Obama told a joint news conference at the White House with British Prime Minister David Cameron. Cameron said he saw an "urgent window of opportunity" before "worst fears" in Syria would be realized, and said Britain would double its non-lethal support to Syrian opposition forces in the coming year. WASHINGTON, May 13 (Reuters) - U.S. President Barack Obama and British Prime Minister David Cameron on Monday pledged their continued support for the people of Syria, including more humanitarian aid and a push toward a transitional government to help bring peace. Obama, speaking at a joint news conference, said the United States will continue to work to establish the facts about chemical weapons use in Syria. Cameron said his nation would double non-lethal support to the Syrian opposition in the coming year. WASHINGTON, May 13 (Reuters) - British Prime Minister David Cameron on Monday said a proposed free trade agreement between the European Union and United States should cover all sectors, drawing a contrast with France, which wants to leave out sensitive cultural industries. "To realize the huge benefits this deal could bring will take ambition and political will. That means everything on the table, even the difficult issues, and no exceptions," Cameron said at White House news conference with President Barack Obama. Environment in Syria is "a combustible mix," Obama says. Pres Obama says he'll be persistent about seeking to broker a deal providing for Assad's departure, but one that leaves Syria intact. Pres Obama said he learned of the IRS matter from news reports last Friday. WASHINGTON, May 13 (Reuters) - British Prime Minister David Cameron on Monday said he has not made a decision to arm the opposition in Syria, but that Britain can do more through technical assistance and other help to the Syrian opposition. Speaking at a joint news conference with U.S. President Barack Obama, Cameron said helping the opposition was key to preventing the growth of extremists in Syria. Holder says that in his years as an attorney on these matters (since 1976), this leak was the most serious, or among the most serious, in terms of posing a threat to the American people. Asked about IRS controversy and whether criminal laws were broken, Holder says he's ordered an investigation. "If not criminal, we can certainly agree that [the IRS actions] were outrageous." Holder says the deputy AG has written a letter to AP contradicting some of what was in the AP letter. "Aren't you trampling on civil liberties in the same way the Bush administration did?" Holder: "No we're not…"
"I'm proud." -- Eric Holder on Obama Administration's record on civil liberties. Holder doesn't answer whether other news organizations had their phone records subpoenaed. A question for the deputy. An Ivy League fest over at House Judiciary. Yale's Lamar Smith questioning Columbia's Eric Holder. 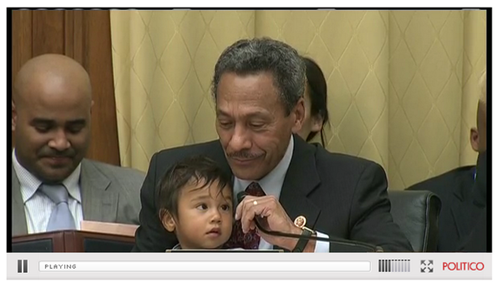 Mel Watt has not explained why he has a child is on his lap. Child now beginning to moan into the microphone. "Unrest in the Middle East creates a permissive environment for terrorists In the days an weeks ahead, we need to be especially vigilant in protecting our people." WASHINGTON, May 15 (Reuters) - The White House on Wednesday released more than 100 pages of emails detailing discussion inside the administration over last year's attacks on a U.S. diplomatic compound in Benghazi, Libya. - On 10 September we notified Embassy Cairo of social media reports calling for a demonstration and encouraging jihadists to break into the Embassy." "There is massive disinformation out there, in particular with Congress. They all think it was premeditated based on inaccurate assumptions or briefings. So I think this is a response to not only a tasking from the house intel committee but also NSC guidance that we need to brief members/press and correct the record." Question on email from unknown person: "Second tick says we know extremists with ties to AQ participated in the attack, which implies complicity in the deaths of American officers. Do we know this?" Response from unknown: "Good point that it could be interpreted this way -- perhaps better stated that we know they participated in the protests. We do not know who was responsible for the deaths." WASHINGTON, May 15 (Reuters) - President Barack Obama will deliver a statement on the controversy surrounding the Internal Revenue Service's targeting of conservative groups, the White House said on Wednesday. The president is set to speak at 6 p.m. (2200 GMT). He met earlier Wednesday with Treasury Department officials to discuss the undue scrutiny the IRS gave to applications for tax-exempt status from Tea Party groups. "Sorry to be late to this discussion. We need to resolve this in a way that respects all the relevant equities, particularly the investigation. There is a ton of wrong information getting out into the public domain from Congress and people who are not particularly informed. Insofar as we have firmed up assessments that don't compromise intel or the investigation, we need to have the capability to correct the record, as there are significant policy and messaging ramifications that would flow from a hardened mis-impression."